• When downshifting from fifth gear to fourth gear, caution should be taken not to inadvertently press the gear shift lever sideways in such a manner that second gear is engaged. Such a drastic downshift may cause the engine speed to increase to the point that the tachometer will enter the red-zone. Such overrevving of the engine may possibly cause engine damage. • Do not downshift more than 2 gears or downshift the gear when the engine is running at high speed (5,000 RPM or higher). Such a downshifting may damage the engine. • During cold weather, shifting may be difficult until the transaxle lubricant has warmed up. This is normal and not harmful to the transaxle. 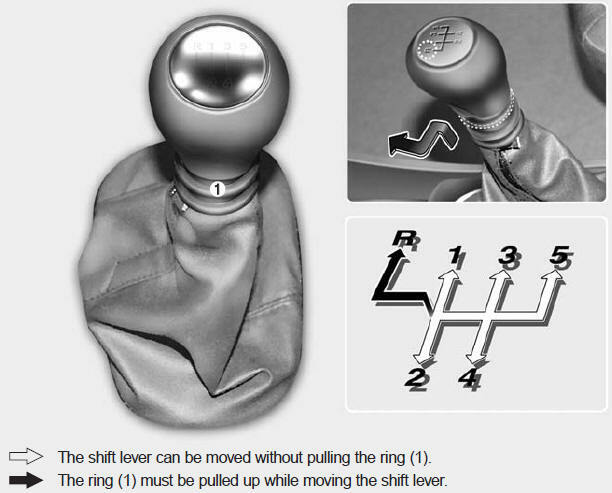 • If you've come to a complete stop and it's hard to shift into 1st or R (Reverse), put the shift lever in N (Neutral) position and release the clutch. Press the clutch pedal back down, and then shift into 1st or R (Reverse) gear position. • If your vehicle has a manual transaxle not equipped with a ignition lock switch, it may move and cause a serious accident when starting the engine without depressing the clutch pedal while the parking brake is released and the shift lever not in the N (Neutral) position. The clutch should be pressed all the way to the floor before shifting, then released slowly. The clutch pedal should always be fully released while driving. Do not rest your foot on the clutch pedal while driving. This can cause unnecessary wear. Do not partially engage the clutch to hold the car on an incline. This causes unnecessary wear. Use the foot brake or parking brake to hold the car on an incline. Do not operate the clutch pedal rapidly and repeatedly. • Never take the car out of gear and coast down a hill. This is extremely hazardous. Always leave the car in gear. • Don't "ride" the brakes. This can cause them to overheat and malfunction. Instead, when you are driving down a long hill, slow down and shift to a lower gear. When you do this, engine braking will help slow the car. • Slow down when you encounter cross winds. This gives you much better control of your car. • Be sure the car is completely stopped before you attempt to shift into reverse. The transaxle can be damaged if you do not. To shift into reverse, depress the clutch, move the shift lever to neutral, wait three seconds, then shift to the reverse position. • In the event your vehicle leaves the roadway, do not steer sharply. Instead, slow down before pulling back into the travel lanes.